Tuna is a salt water fish that is part of the mackerel family and has become one of the most valued and attractive fish on the market because of its delicious taste, global availability, and healthy components that make it a favorable substitute for red meat and poultry. Tuna is a salt water fish that is part of the mackerel family and has become one of the most valued and attractive fish on the market because of its delicious taste, global availability, and healthy components that make it a favorable substitute for red meat and poultry. Although the mercury scare has driven many people away from fish, like tuna, when eaten in moderation, tuna is very healthy. It is loaded with vitamins and nutrients, low in saturated fat, and is an excellent source of protein. 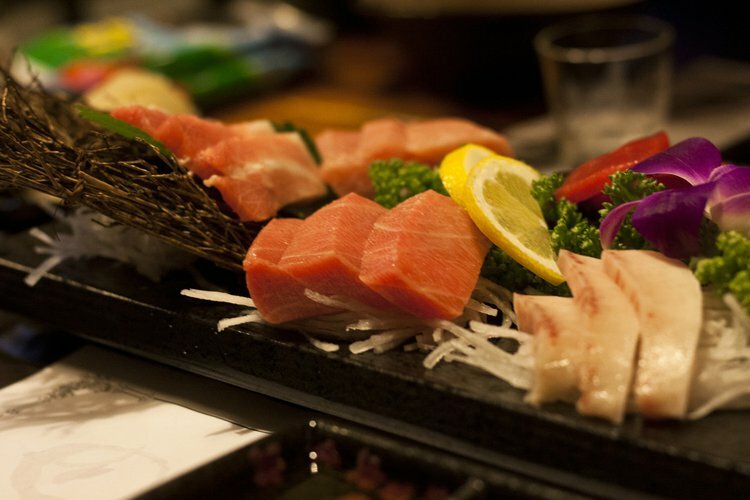 A three-ounce cut of bluefin tuna contains 25 grams of protein and only one gram of saturated fat. A health advantage of eating tuna fish is that it is full of the natural compound vitamin A, which helps prevent vision-related conditions such as night-blindness and macular degeneration. It can also aid in vision improvement. Vitamin A is known as retinol because it produces the retinal pigments. The retina is the light-sensitive inner surface of the eye. One of the health benefits of tuna is that it contains a healthy amount of selenium, with 57% of the daily-recommended intake for every three ounces. Selenium can help improve bone health (including the nails, teeth, and hair) by adding strength and durability. Selenium is also an essential micronutrient and a powerful antioxidant that relieves the body of free radicals. Phosphorus and zinc also make enormous contributions in helping build strong bones and a healthy bone matrix; tuna are rich in these minerals too. Tuna has a high content of magnesium, which is a mineral that is directly linked to enhanced sleep qualities; including the time length of sleep and restfulness. Tuna can thus help individuals have a peaceful sleep. The chance of sleep disorders, like insomnia, is also reduced since magnesium helps regulate the body metabolism too. Another one of the benefits of tuna is that it is a good source of B-vitamin complex elements such as riboflavin, vitamin B12, and niacin (B3). Riboflavin assists in the conversion of carbohydrates into sugar, which fuels many body functions. Vitamin B12 not only assists in energy production, but also helps with blood formation, DNA synthesis, and helps form the fatty substances around brain cells, called myelin. Niacin has been known to increase an individual’s “good” cholesterol and alleviate the risk of cardiovascular problems. A deficiency of niacin can cause Pellagra, which is a disease that is characterized by diarrhea, dementia, dermatitis, and an inability to sleep. Tuna is quite famous for its rich omega-3 fatty acid content. Omega-3 fatty acids are anti-inflammatory and can help reduce blood pressure. Maintaining a stable blood pressure can significantly boost heart health by lowering the strain on the cardiovascular system. This will decrease the risk of attacks, strokes, and atherosclerosis. Individuals who are trying to find alternative sources of proteins, other than red meat, may find tuna as a great source. Fish, such as tuna, also have a healthy amount of omega-3 fatty acids to help protect the heart and brain. However, one must be careful to not eat too much tuna, because it may contain certain quantities of mercury. Bao, D. Q., Mori, T. A., Burke, V., Puddey, I. B., & Beilin, L. J. (1998). Effects of dietary fish and weight reduction on ambulatory blood pressure in overweight hypertensives. Hypertension, 32(4), 710-717. Hardy, R. W. (1996). Alternate protein sources for salmon and trout diets.Animal Feed Science and Technology, 59(1), 71-80. Seet, S. T., & Brown, W. D. (1983). Nutritional quality of raw, precooked and canned albacore tuna (Thunnus alalunga). Journal of Food Science, 48(1), 288-289. Mozaffarian, D., Lemaitre, R. N., Kuller, L. H., Burke, G. L., Tracy, R. P., & Siscovick, D. S. (2003). Cardiac benefits of fish consumption may depend on the type of fish meal consumed the cardiovascular health study.Circulation, 107(10), 1372-1377. Siddiqui, R. A., Shaikh, S. R., Sech, L. A., Yount, H. R., Stillwell, W., & Zaloga, G. P. (2004). Omega 3-fatty acids: health benefits and cellular mechanisms of action. Mini reviews in medicinal chemistry, 4(8), 859-871. Daviglus, M., Sheeshka, J., & Murkin, E. (2002). Health benefits from eating fish. Comments on Toxicology, 8(4-6), 345-374.